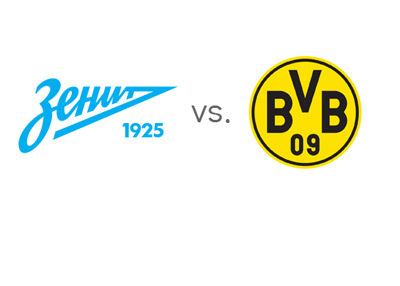 Zenit St. Petersburg will host Borussia Dortmund in the first leg of the UEFA Champions League round of 16 on Tuesday, February 25th, 2014. This is the first time these two teams are meeting in European competition. Zenit are currently on the Russian winter break and have not played a competitive match since mid December, when they lost to Austria Vienna 4-1. Zenit managed to secure second place in Group G with only six points (which is a record) and qualify for the knockout rounds. Zenit are currently second in the Russian Premier League tables, even on points with first place Lokomotiv. On Tuesday, the St. Petersburg side will be without their attacking midfielder, Roman Shirokov, due to injury. The team's leading domestic league scorers this season are Miguel Danny with nine goals so far and Hulk with seven. Dortmund are currently in third place in the German Bundesliga tables, behind Bayern Munich and Bayer Leverkusen. After eliminating Frankfurt in the quarter-finals of the DFB Pokal and then beating them 4-0 in the league last week, Borussia got their butts kicked by Hamburg SV over the weekend. Not sure what happened to Jurgen Klopp's team, but this free-kick goal in the 90th minute pretty much sums it all. Last year's UEFA Champions League finalists finished first in a very tough Group F, ahead of Arsenal, Napoli and Marseille. On Tuesday, Dortmund will be without Subotic, Blaszczykowski, Bender and Gundogan due to long term injuries. The team's leading domestic league scorer this season is Robert Lewandowski with fourteen goals. Borussia are the clear favourites, according to the odds, to win in St. Petersburg on Tuesday and to qualify for the next round. Russian football is on the rise these days and Zenit's team is stacked with good (end expensive) players. The truth is that they have underperformed in Europe this year so far and it will be interesting to see what kind of shape they are in after not playing competitively for two months. Part of Stadion Petrovski will be closed on Tuesday due to a UEFA punishment for racism issues. In Dortmund, the situation is quite the opposite when it comes to games played. Borussia are competing on many fronts these days and could be experiencing a burnout, as it was evident in their last match. The Yellow and Blacks are also plagued with injuries, which could make things more difficult on Tuesday. But as they say 'You don't become a bad team overnight' and Lewandowski and Co. are the big favourites. The weather in St. Petersburg tomorrow is supposed to be sunny. Temperature around 2 degrees Celsius. The kick-off is at 6pm CET.